Chemical preservation (with or without the help of special equipment) ensures long term protection. Depending upon the method of bamboo treatment, chemical preservatives can impart short term or long term protection. With a few exceptions, chemical preservatives to protect bamboo against biological attacks and degradation are toxic. Selection and application has to be done with great care to meet performance, environment requirements and safety. Depending upon the carrier solvents, bamboo preservatives are divided into 2 different categories: Non-fixing and fixing type preservatives. Non-fixing preservatives will leach out the bamboo when exposed to rain. In other words non-fixing type preservatives are NOT suited for outdoor use. Non-fixing bamboo preservatives mainly consist of boron salts, which are effective against borers, termites and fungi (except soft rot fungi). These boron salts are dissolved in water. After treatment, the water evaporates leaving the salts inside the bamboo. They are not toxic and can be used for treating bamboo products like baskets, dry containers, etc. which come in contact with food products. Curing bamboo with borax and boric acid is the most popular bamboo preservation method (for indoor use) around the world because it is effective and more environmentally friendly than other wood preservatives. 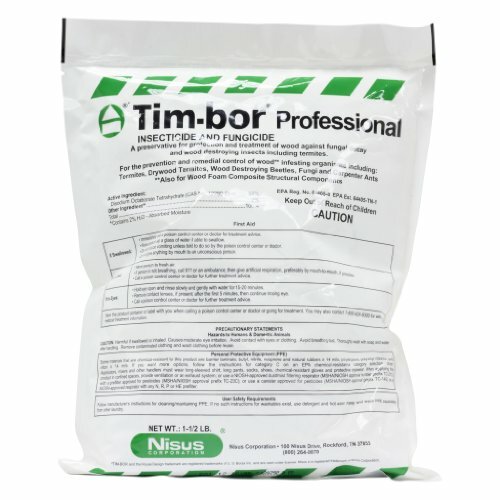 The combination of boric acid and borax in a ratio of 1:1.5 is an alkaline salt called: Disodium octaborate tetrahydrate (Na2B8O13 x 4H2O) and is available in pre-mixed powder form, usually under the commercial names: Tim-Bor﻿ or SoluBor, among others. Disodium octaborate tetrahydrate is a white, odorless, powdered substance that is not flammable, cumbustible, or explosive and has acute low oral and dermal toxicity. The product itself is fire retardent and shows no hazardous decomposition. This salt, is used as an insecticide and fungicide, and is also effective against fungi and algae. It has an infinite shelf life and is not affected by temperature. Diluted with water, bamboo can be impregnated, submerged or sprayed with this chemical. * How to Interpret the Terms: 'Ratio' and 'Concentration'? The ratio of the chemical solution is based on kilograms per 100 liters of water. a mixture of 2 kg of boric acid / 2 kg of borax / 500 gr of sodium dichromate in 100 liters of water. a mixture of 4 kg of boric acid / 4 kg of borax / 1 kg of sodium dichromate in 100 liters of water. These chemical bamboo preservation formulations are proportionate mixtures of different salts which interact with each other in the presence of bamboo and become chemically fixed. In principle, the degree of fixation and efficacy depends upon the nature of the components and their combination and concentration. For example, Chromium is responsible for fixation, copper is effective against decay fungi and soft rot and the third compound acts against insect and fungus. The process of fixation requires some weeks during which the material should be stored under cover. Slow fixation is preferred in case of bamboo as it allows diffusion and better distribution of preserving salts. CCA is a heavy duty broad spectrum chemical bamboo preservative patented as AsCu. It has been found to provide protection for 50 years or more. Outdoor use is recommended only due to the arsenic component, which can also causes a green coloration on the bamboo. CCB is a broad spectrum chemical bamboo preservative and a good alternative to CCA, but less effective with a lower degree of fixation, because of the boron component. Zinc Chloride is highly hygroscopic and treated bamboo will give a wet look in rainy season. This can adversely help paints and other finishes. This treatment is intended to protect materials against fire as well as decay and insect attack. It is a broad spectrum bamboo preservative and is a cost effective chemical for treatment for exterior applications. It has been used for treating railway sleepers and wooden poles. Coal tar and creosote available from coal is a dark brown viscous liquid. Creosote should be used exclusively for pressure processes or hot and cold treatment. Being oily, it imparts water repellence to the treated material. It is effective against fungal and insect attack. Due to its dark brown color and bad odor, its use is restricted to exterior applications, especially in contact with mud/ ground. These are slightly more expensive bamboo preservatives where the organic solvent acts as a carrier for toxic molecules and later evaporates, leaving the active ingredients behind. They are available commercially in ready-to-use forms. A good formulation is an appropriate mixture of fungicides and insecticides. There is little change of color of the treated material but a residual odor may remain for some time. The method of use will be recommended by the manufacturer. Formulations available in concentrates are more economical to use. It is a more eco friendly substitute for Pentachlorophenol. Ready to use (5%) solution of this fungicide along with insecticides for broad spectrum performance are commercially available. Concentrates which can be diluted with mineral turpentine oil are more economical for industrial use. They have emerged as alternatives to other organic preservatives which cause environmental hazards. Napthenates of copper and zinc are most common (metallic soaps). They are available as ready-to-use formulations containing appropriate amounts of insecticides. They are slightly more expensive than TCP formulations. However, they are more eco-friendly and also have no pungent smell. I live in Florida. A friend will let me cut poles from his clump of bamboo. I have access to a small pond where I can soak the bamboo. I plan to build a pergola cover. I would like to span a fish pond 18 feet wide. I want the poles to last at least ten years. Should I use a preservative like CCB, or will soaking in water remove the starches and preserve the wood? How long should the poles soak? How is CCB applied? Is CCB just painted on the outside of the poles? They are too long for me to soak them for any length of time. How far can 3" poles span without support in the middle (if they only support themselves)? With the treatments that you have listed, what are the degradation times for bamboo including if it is not treated? Untreated bamboo has an average durability of less than 2 years (outdoor use). Treated bamboo on the other hand can be in service for a life time, as there are bamboo structures in Asia and Latin America that are more than a century old. What is the quantity of chemical preservatives required to treat bamboo? Is there any thumb rule or formula to find out the exact quantity of chemicals required the cure one bamboo pole? I am student of M.Tech Civil & working on a "Feasibility Analysis of a Bamboo Treatment Plant", in which the financial aspect is very important for such plant erection. The financial aspect requires the treatment cost of bamboo. Preservation treatment may become a new kind of business in rural areas, so such analysis is very important. I would be very interested to read your findings on this. We are looking at a possible JV bamboo processing facility with local government on a Pacific Island. We are investigating ways of value adding for the farmers and this would be a possible option. We propose to have them harvest bamboo and cut into correct sizes, with equipment we will provide. Depending upon costs we could possibly add a further option for them to value add by treating the bamboo prior to delivery. Non-toxic would be our best option, as village safety adherence can be an issue. So disappointed to see so many very toxic chemicals suggested. I'm looking for a non-toxic, non-chemical finish. I remember seeing people polishing bamboo floors with coconut husks in the Philippines. Anything like coconut oil that might be protective? Let the poles or the splits dry thoroughly under the sun. Then soak them in the sea for 2 months. The dry poles and splits easily absorb the salt of the sea. This sea-water treatment gives the bamboos at least 50 years of protection from termites, borers and fungi. Its widely used in Asia and also used for wood treatment. Very safe and natural, very effective and cheap and truly long-lasting. Good luck. There is a difference between finishes and preservatives. Finishes (such as natural linseed oil) are used to give bamboo a desired look or to protect them from weathering. But preservatives are used to treat the bamboo against insect infestation. Is it advisable to treat bamboo chemically after heat treatment? What are the benefits? Very fine but may I suggest to give commercial name of chemical items?! That would be impossible as every country has different commercial names for their products. Chemical names are much more useful as they are the same in every country. I am using bamboo as a moulding on the exterior of houses. I need it to be warrantied for 20 years. What do you suggest to make it insect and rot resistant? Would i use CCA? Arsenic is very toxic and often prohibited, I would use CCB instead and brush a UV and water resistant coating on it every two years. What about Lime Water? How about Water Glass (Sodium or Potassium silicate)? It seems like it both are being used quite frequently now. Lime water has the benefit of being very inexpensive, but my guess is it would leech out over time. A benefit of using it would be if one is planning a lime coat over the bamboo preserved with lime water. Some salts may interact negatively with lime plaster. I am fully convinced with the process, I went through all the process and it was good. now my only concern is how can i test whether the bamboo is treated or not. We are thinking about using bamboo as roof tiles, we have seen it in various projects in Asia, but we haven't found witch treatment they use. For full exposure in a tropical landscape such as Central South America, with lots of rain, witch treatment should you suggest? I want to build a bamboo structure in Maharashtra,India with a very moderate rain fall. Would somebody please suggest me relatively inexpensive bamboo surface treatment which will make my structure safe for at least 20 years. You can treat bamboo with UV blocking polyurethane and it can last for many years. But you will need to re-coat it every year in moderate climates, and re-coat every 6 months in heavily rainy climates. But it does work. I find a gallon of UV blocking polyurethane runs about 40 to 50 bucks in the U.S. And it will coat and area approx 50 feet long and 6 feet high thoroughly. Is it possible to treat bamboo by submersing in sea water?